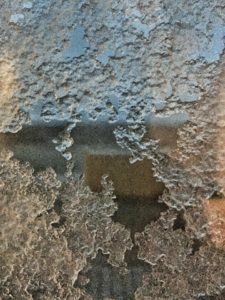 Today dawns relatively clear, but the forecast calls for high winds. We’re in no hurry to get moving from the cozy Carina Guesthouse, but as we’re eating breakfast, a beautiful sunrise begins to unveil through the dining room windows. We chug down the rest of our coffee and scarf down a few bites of delicious homemade bread and hit the road. 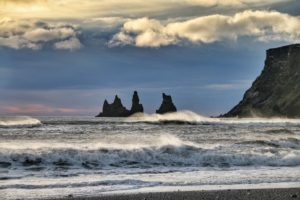 We decide to head straight to Dyrhólaey to photograph the unique rock formations that sit off the coast here, and then we’ll head back to town for the views from Vik’s hilltop church looking east. Fortunately, the winds have not picked up too much just yet, and with the right gear, we’re able to photograph for a good two hours without freezing. All of what we have seen so far in Iceland has been jaw-droppingly beautiful, but there’s something special about Vik and Dyrhólaey. Large basalt rock cliffs drop down to a long black sand beach, and off in the distance, three jagged rock structures jut out of the ocean. Closer in shore is a larger lone rock structure, and the high tide swirls around it. Soft light stays with us for most of the morning, and by noon, we feel we’re content with what we’ve captured. 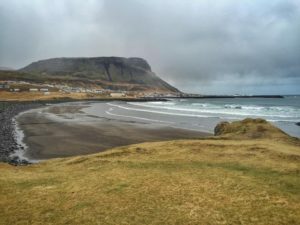 We drive the 15 minutes back to downtown Vik, pull into a gas station for a hot chocolate break, and see a pathway leading out to a separate beach. Here we have an eastward view of the craggy coastline, but we’re less protected from the elements, and as we’re trying to capture this new angle, we’re literally being sandblasted. I can feel the black sand hitting the back of my neck, and as this is happening, I look up to see Bill’s tripod being blown over by a gale force wind gust. We decide to hightail it to the car with our heads down to avoid more sandblasts. 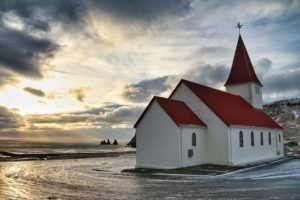 We do make one last stop before leaving Vik, and that’s at the hilltop church where we’re afforded views of the entire, yet small town of Vik and the coastline below. We park the car off to the side and get out to snap a few pictures of the view. The parking lot is like a skating rink and the wind gusts are so strong, I have a hard time not sliding away. Luckily I grab on to the trunk of the car to stop myself. Right here is an indication of how our afternoon drive will play out. The winds are reaching 60-65mph + when we leave Vik, and road conditions are less than ideal. We plug in Selfoss to the GPS and begin the 1 1/2-hour drive. 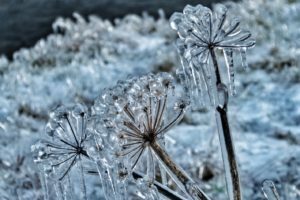 We’ve had little sunlight or warmth so far today, so patches of ice can still be found in places and the wind is vicious. Not only are the winds whipping snow across the roadways, they are also so fierce that it’s difficult to keep the car from veering. I’m driving now and it’s my turn to have a death grip on the wheel. We’re no more than 20 minutes from Vik, when I hit a patch of ice, panic, hit the breaks and begin sliding from one side of the road to the other. At one point, I’m sure we’re going to hit one of the yellow posts on the right side of the road, and the next moment, I’m certain we’re going to collide with the white SUV heading towards us from the other direction. By the grace of God, I right the car, and Bill and I look at each other with white faces. How the hell did we not just die??? or at least seriously damage the vehicle?? 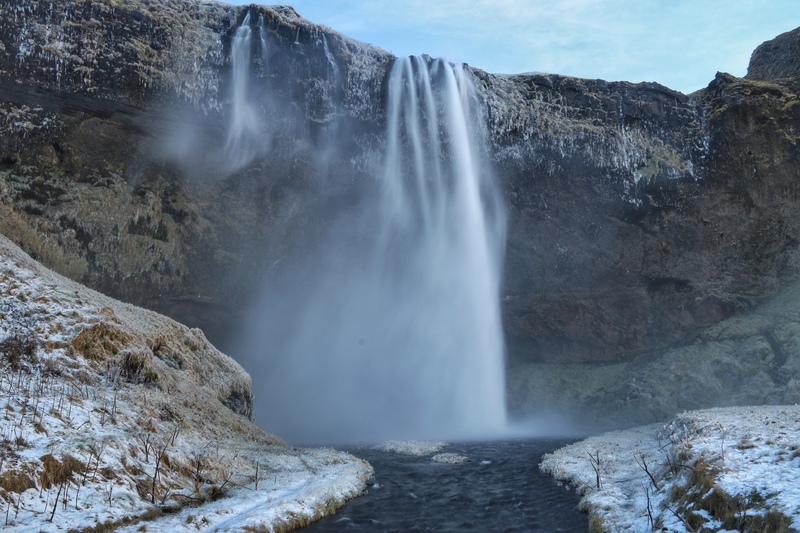 I’m a bit weak and wobbly now, so we decide to pull over at Skogafoss. Unfortunately, it’s just too cold and windy to even consider leaving the car for pictures. We pull into a parking lot to turn around and watch as other travelers skate their way to and from their cars. Back on the road, we begin to drive parallel to a fjord, and this offers us some sort of protection from the wind at times. Despite wanting to be in Selfoss for sunset, we know we can’t hurry, so when we pass Seljalandsfoss, we decide to stop for some daylight pictures. 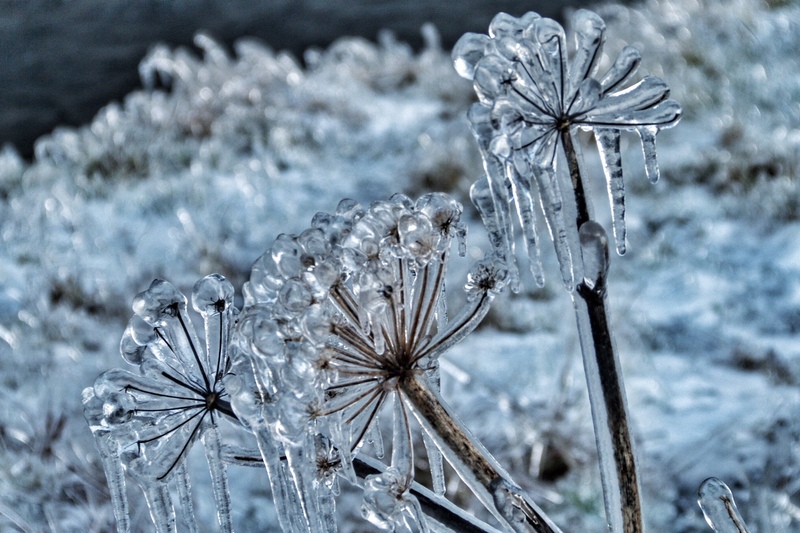 Pathways are slick and the grass in front of the waterfall is covered in ice crystals. The wind is whipping the falls, creating a mist that is (again) soaking the pathway that leads behind. We now know better than to attempt to hike up. (We’ll save that for a summer trip!) It’s a beautiful scene though, and at 3:30 the entire landscape surrounding us is glowing gold. Conscious of the time, we get back in the car to finish the drive to Selfoss. We have a hostel booked here for the night and decide to photograph Selfoss waterfall tonight and Gulfoss at sunrise. 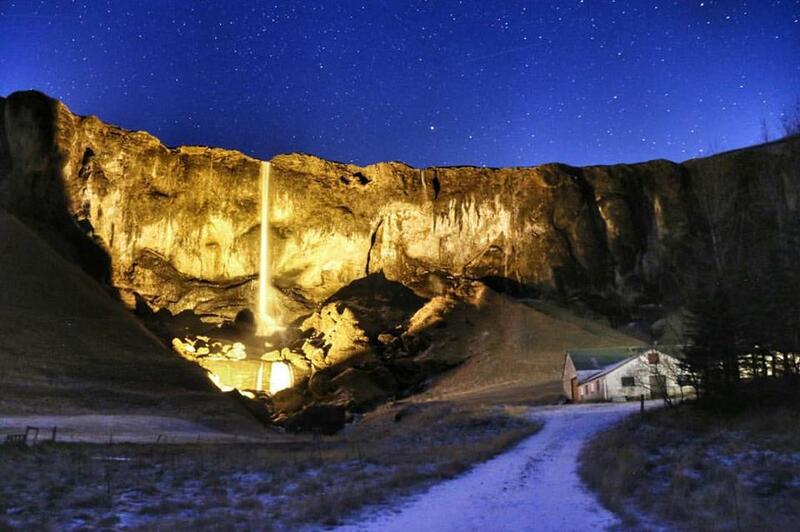 However, as we approach Selfoss, we realize that Selfoss waterfall isn’t in the city of Selfoss at all. It’s not even close. It’s about seven hours away in the northeastern part of the country. Ok, epic travel planning fail, but I’m certain we’re not the first people to make this mistake! We still have tomorrow morning to photograph Gulfoss and Geysir and we look at tonight as a night to just chill out. 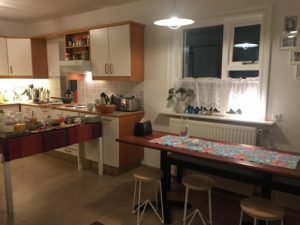 We check into the lovely Guesthouse Garun Heidmork, which is a three-story home with a total of about seven rooms and a beautifully furnished kitchen. We make our way up to the attic apartment, dump our backpacks and head out to find food for dinner. 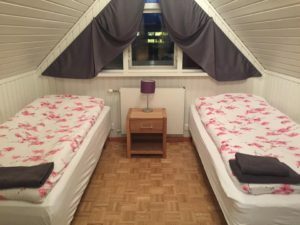 When we return later that evening, the road outside is a sheet of ice, and the wind is so fierce that the attic room we’re sleeping in is creaking. We fall asleep to this unsettling noise, wondering what our last day of exploring holds for us! Despite a late night, we are up super early and get ready and packed up for the day. We head upstairs and Thora has prepared a full homemade breakfast, complete with waffles and homemade jams! 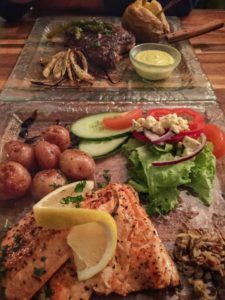 We enjoy what is becoming our only sit down meal of the day, thank Thora for her hospitality and head out for Jokulsarlon. As we drive west along the ring road back to the lagoon, the sun is rising to our left and the moon is setting to our right. It is the last few days of the “super moon” and we watch as a huge giant white ball drops behind the fjords. 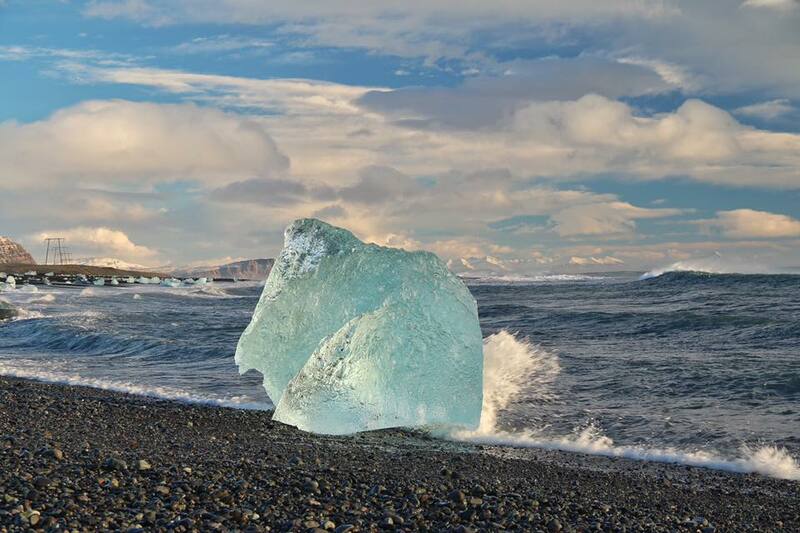 We park up at the lagoon but immediately walk over to the black sand beach, where chunks of icebergs are being lashed by water in the wave break. Sunrise is continuing behind, making the ice glow various shades of gold, violet, pink and blue. We spend well over two hours shooting stills and video here – we just can’t get enough of this natural, unique beauty! We head back over to the lagoon and grab a hot chocolate at the little cafe and then inquire about a boat ride for later in the afternoon. 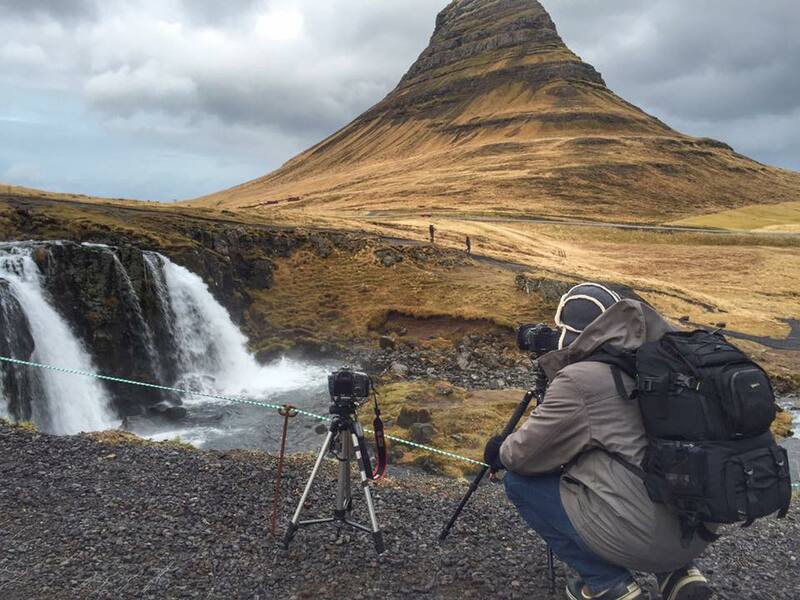 Our plan is to head to Skaftafell National park to photograph Svartifoss and then head back to Jokulsarlon for a boat tour and sunset. Unfortunately, we find out that boats aren’t operating today due to too much ice debris in the lagoon. We make our way to Skaftafell National Park. which is about a 45-minute drive. 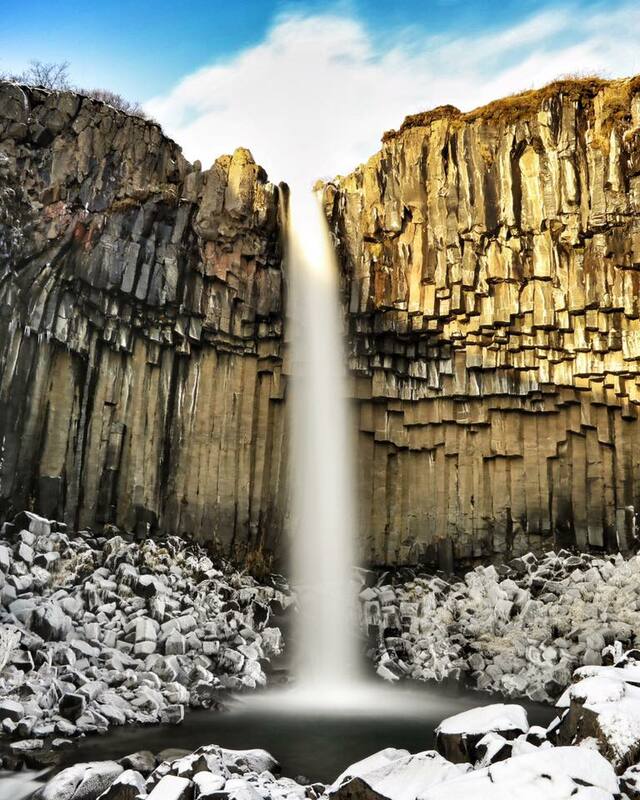 Skaftafell, or rather Vatnajökull National Park is home to the Vatnajökull Glacier, but we have come to photograph Svartifoss, a waterfall that sits 1.8km into the park. We begin the hike up and arrive around 2:00. 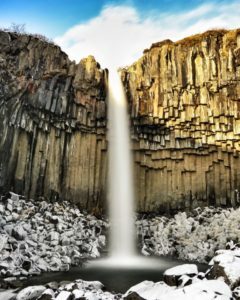 The waterfall is surrounded by basalt rock columns that give me the feeling we’re peering into the center of the earth. Surrounding rocks and shrubbery are covered in a layer of white, frozen mist. We spend about 1 1/2 hours shooting here, playing with long exposure and neutral density, and we don’t realize how much time has passed. 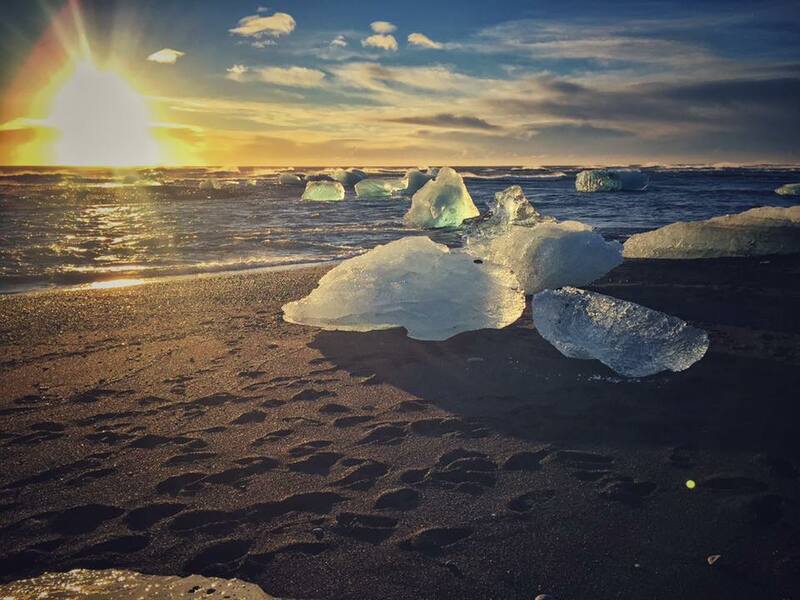 We need to hurry if we want to make it back to Jokulsarlon for sunset. On the hike back down, the light is perfect though, and I want to stop and savor it and take more pictures. Behind us Vatnajökull glacier is brilliant white against an intense blue afternoon sky. To our right are fjords in the distance and bare birch trees, and below us the land is flat and white, and little rivulets lead out to the ocean ahead. 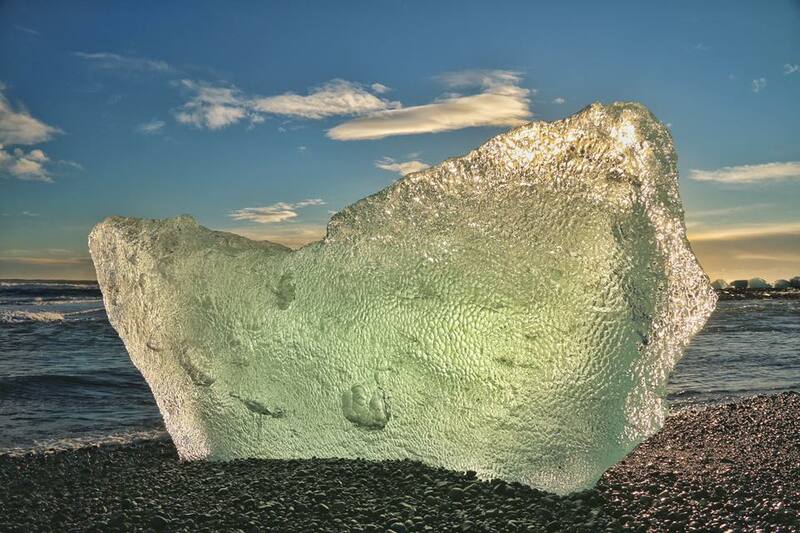 By 3:45, we are back in the car and heading to Jokulsarlon, but we know we’ve missed the best of the light. We kick ourselves for not leaving earlier, and from the car, we watch as the sun sets to our right. At the lagoon, it’s still a pretty picture, and we decide to head on to Vik with the goal of getting there in time to have a relaxing evening, and maybe even dinner! We begin the two-hour drive, making one stop at Foss á Siðu to photograph the falls at night. Tonight is the clearest we’ve seen the skies since arriving, and we’re able to catch a few shooting stars. Temps are dropping, so we head back to the car and continue on to Vik, arriving at Carina Guesthouse around 8pm. We get checked in and decide as we haven’t had a proper dinner since arriving in Iceland, we should treat ourselves. 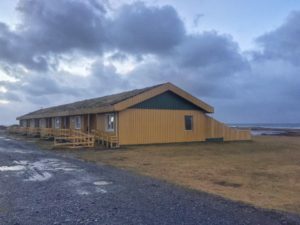 We head over to Suður-Vík Restaurant for a traditional dinner of Arctic Char and Rib Eye, accompanied with a cauliflower soup and homemade bread. After standing out in the cold all day, the food is warming us through, but making us sleepy! 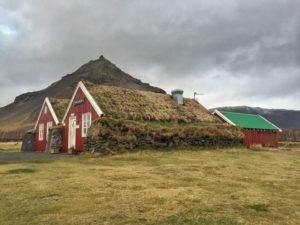 We pay up and head back to the guesthouse, and as we leave the restaurant, we get a view of another almost supermoon rising above Vik’s church on the hilltop in the distance. I wake rested, with no signs of jet lag (thankfully), have a long overdue shower and pack up. Laura has brought breakfast over to our apartment – a spread of breads, jams, meats, cereal, yogurt, coffee and juice. 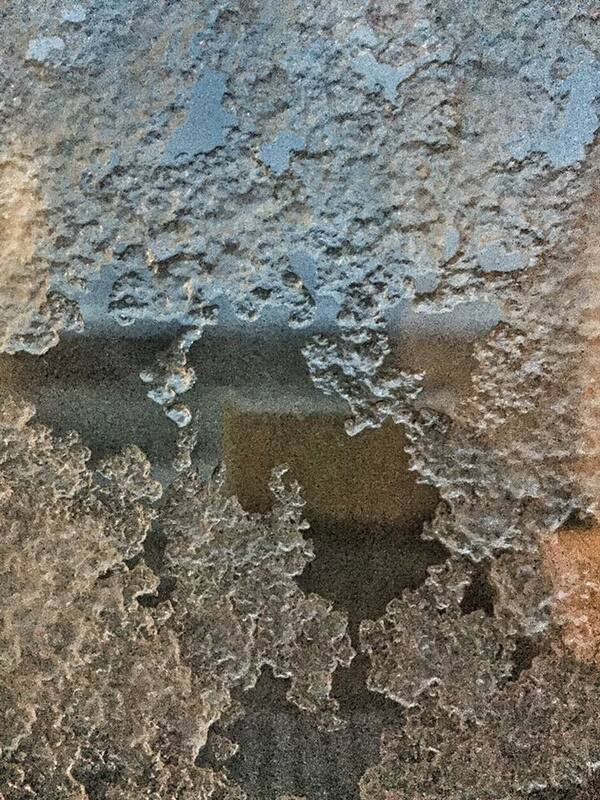 It’s nice to not have to go outside just yet, seeing as the wind and rain have picked up again, and a frost has gathered on the outside window panes. Over breakfast, we decide to head to the easternmost point on our itinerary, Jokulsarlon, and we will spend the rest of our time this week making our way back to Reykjavik. So, today, we have some driving to do. 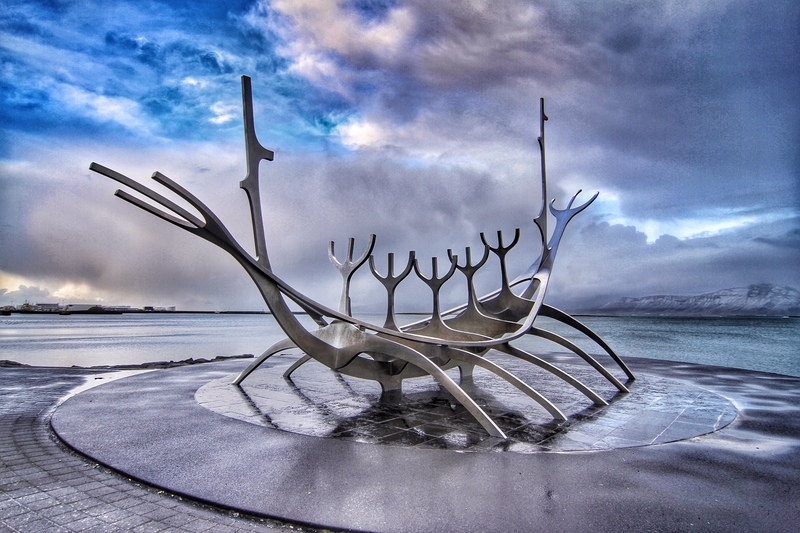 We decide to break the drive in Reykjavik, tour the city a bit and then head on. 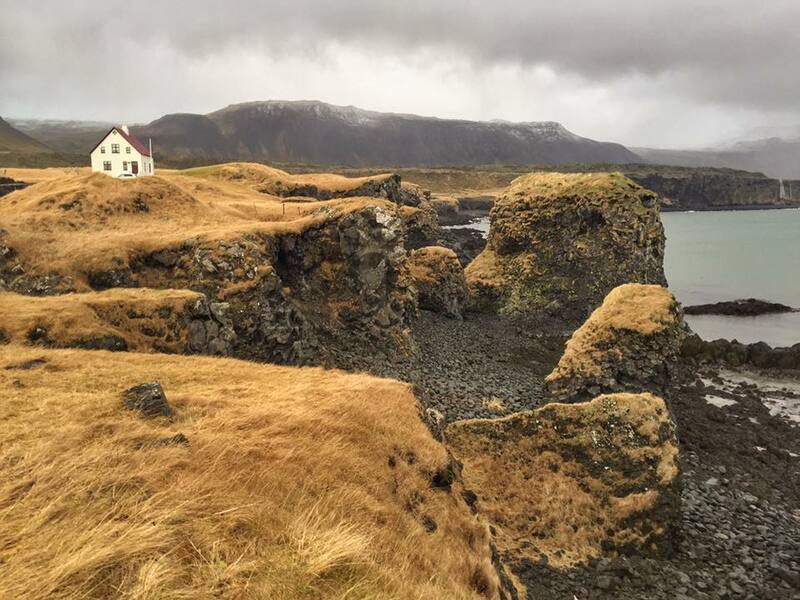 The weather forecast calls for 100% precipitation again today, and we leave Arnarstapi around 10:30 a.m. and begin a snowy drive to the capital city. The sunrise is taking its time and a beautiful scene unfolds. Fjords are glowing pink ahead – the early morning sunlight illuminating the snow that covers them. 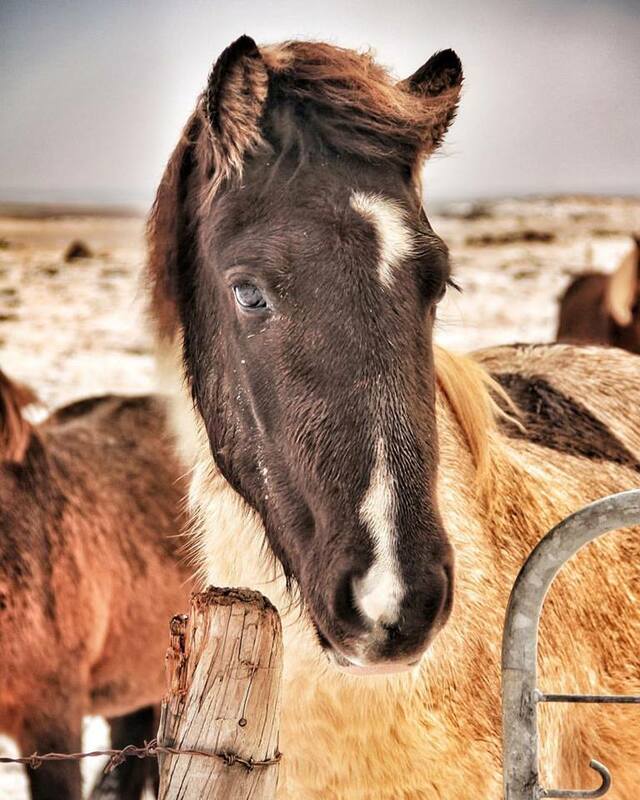 To our right are fields of wild horses. Needless to say, there are quite a few photo stops. We arrive in Reykjavik around 1pm and find free street parking behind Hallgrimskirkja, which is a perfect place to begin our city tour. 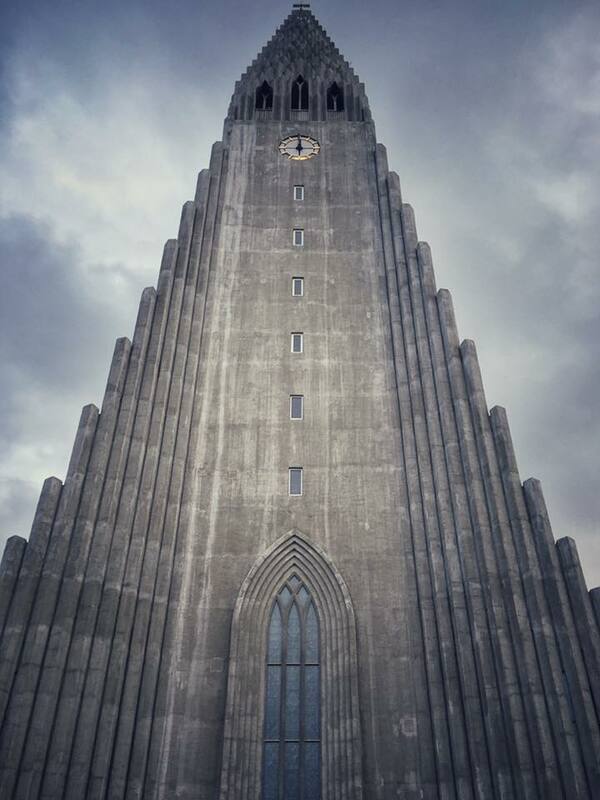 Hallgrimskirkja is a Lutheran Church and one of the tallest structures in Iceland. Construction on the church began in 1945, but it would take over 40 years to complete it. It is truly one of the most unique structures I have ever seen. The outside columns, which grow in height as they reach the main tower, remind me of the basalt rock formations found around many of Iceland’s waterfalls, and the inside is starkly beautiful, just like Iceland itself. It’s simple and puritan in style, but still stunning. 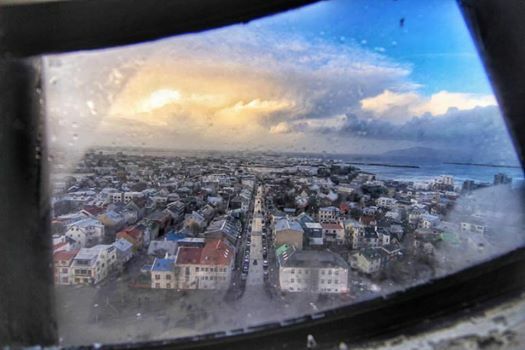 We take the lift up 240 feet to the top of the tower for panoramic views of Reykjavik. Clouds are parting, providing us with perfect afternoon light. From here, we walk along the waterfront to Harpa, Reykjavik’s fine art center. 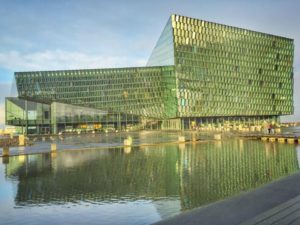 This beautiful structure looks like a combination of various colored panes of glass – highlights of green, blue and purple catch my eye, depending on how the light is hitting the building. The inside is even more interesting, and we spend about 30 minutes taking pictures (and thawing out). 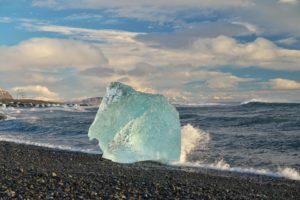 Time is marching on though, and we’re aware of a long drive to Jokulsarlon, so we decide to head back to the car and begin the journey. 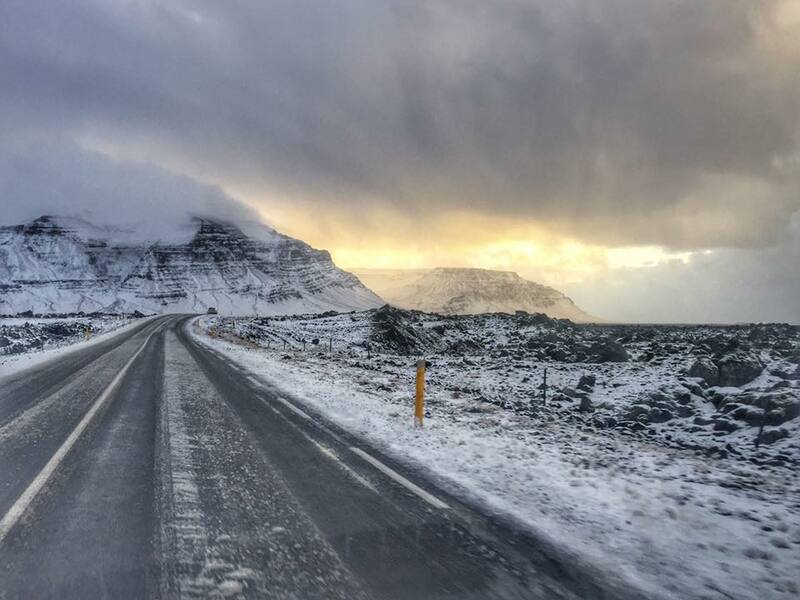 We pick up S1 – Iceland’s ring road, and immediately notice that conditions have worsened throughout the day. A strip of ice lines the middle of our lane, and our tires are positioned either side of it. At any time we ascend, the conditions worsen, and at one point while trying to change lanes, we hit ice and skid out. Bill is driving and fortunately rights the car and we continue on…. very carefully! Conditions improve briefly and just outside of Hella, we see a waterfall lit up in the distance. 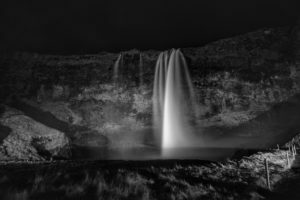 As we get closer, we learn that this is Sjellandsfoss, the waterfall I’ve been wanting to photograph since my last visit here four years ago. The neat thing is, you can actually hike behind the falls and photograph from a completely unique viewpoint. We decide to pull off and do some night shooting, and we’re getting some pretty good shots, but we debate hiking up behind the falls. Another guy has just returned and told us the spray isn’t too bad, despite the high winds, so we decide to give it a try. Moments before we reach the first set of stairs, we realize this is a terrible mistake! It’s as if someone is standing in front of us with a hose, spraying us down. Half way up, and we are drenched, but we keep going hoping to clear the spray. The path has turned muddy now and I look up to see Bill turning around, his camera tripod coming inches from my face as he does. As we make a quick descent, I realize that the tops of my legs are burning from the cold. We hightail it to the car and see two public restrooms in the parking lot. We grab our backpacks, pray that the bathrooms are open and head in to change into dry clothes, hoping that our jackets and boots will dry overnight. We get back in the car and check our gear. Not surprising, my camera is acting up from the cold and damp. 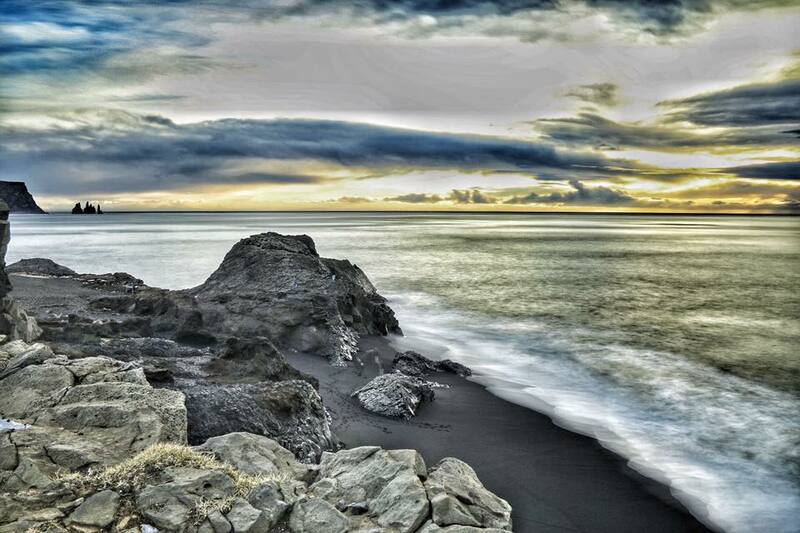 I try not to think about this as we drive the last three hours to Kalfafellstadur. Conditions have improved, but only slightly, and Bill has a death grip on the wheel. We arrive at Kalfafellstadur B&B by 11pm, and Thora has waited up to greet us. She shows us to our room downstairs, which she says is warmer and asks when we’d like breakfast. 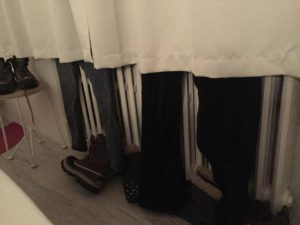 We settle in and hang our wet clothes over the radiator and read the note she has left in the room. 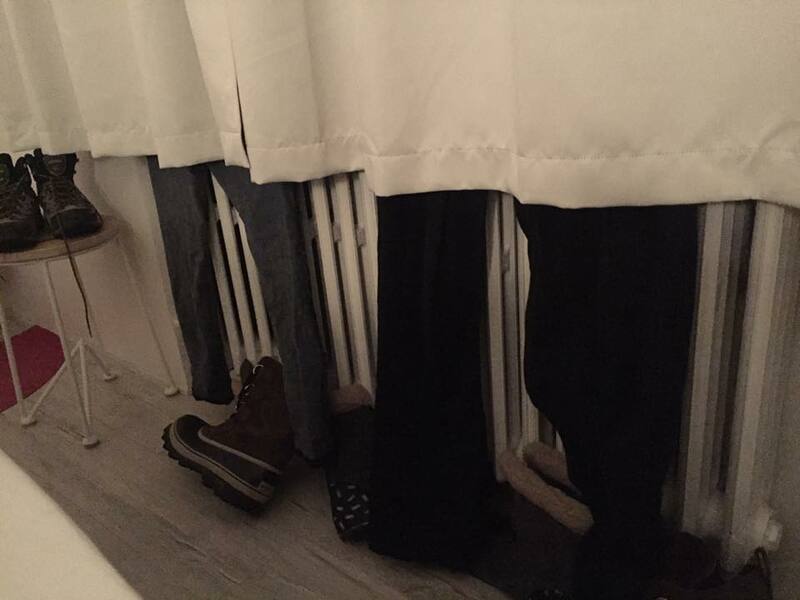 It advises us to sleep like Icelanders, with the radiator off and the windows cracked, to prevent them from “crying.” We leave the radiator on in hopes our clothes will dry, but we crack the window and crawl into bed. 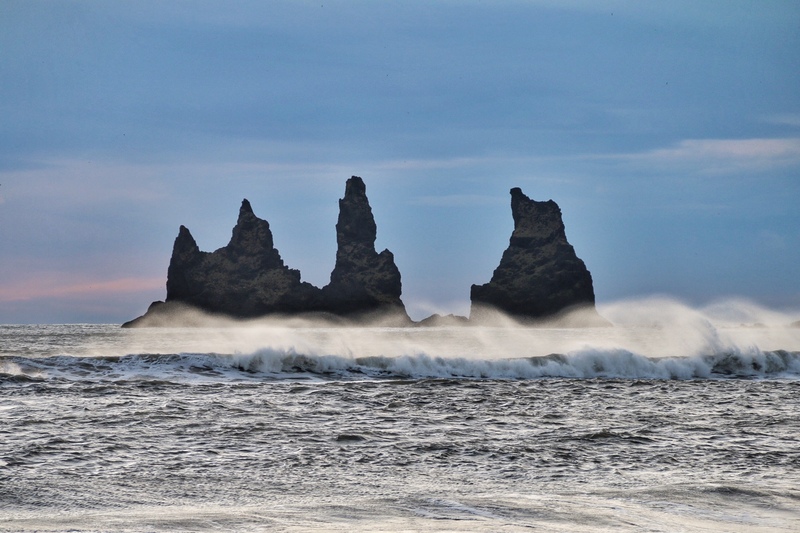 Despite the long day, we’re wired from the drive and excited for sunrise at Jokulsarlon… sleep feels a long ways away. 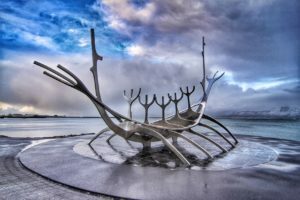 When I found a roundtrip ticket on WOW Airlines from Boston to Reykjavik for $250, I didn’t hesitate. I grabbed my wallet, pulled out my Chase Sapphire Preferred card and quickly snagged the deal with little deliberation. I had been wanting to return to this stunningly beautiful country since my first trip in October, 2012, and the opportunity had just landed in my lap. I quickly texted my photographer friend Bill to let him know about the deal, as we had talked about the possibility of a trip together, and he booked the same flights that day. Fast forward two months, and we were on a boat leaving Nantucket, with a tentative plan to see southern and western Iceland in 5 days. The only thing reserved was a BUDGET rental car, which was waiting to be picked up upon our arrival in Reykjavik. We arrived this morning at 4am. 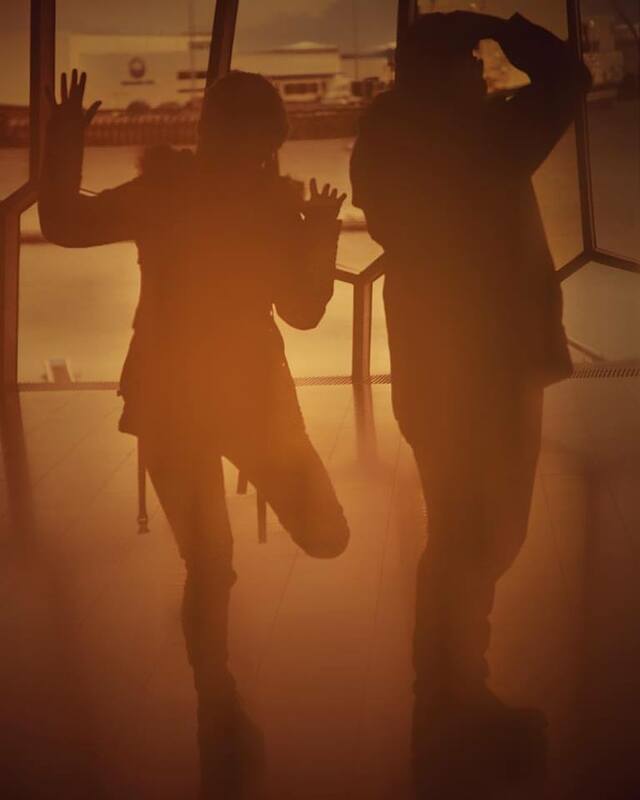 After little sleep on the flight, you would think we would be hightailing it to a hotel for a power nap, but instead we grab a couple of coffees at Reykjavik’s Keflavik airport, change some money and make our way to pick up our rental car. We are given the keys to a gray Suzuki Swift and purchase an internet dongle for $13 a day. This will keep us connected and provide us with wifi for GPS. A good investment to make although I tell Bill that we are not allowed to be on our phones the entire time! By the time we take care of all this, it’s about 5:30 and we head out into a 4-degree early morning to look for our car. Only four hours left until sunrise. 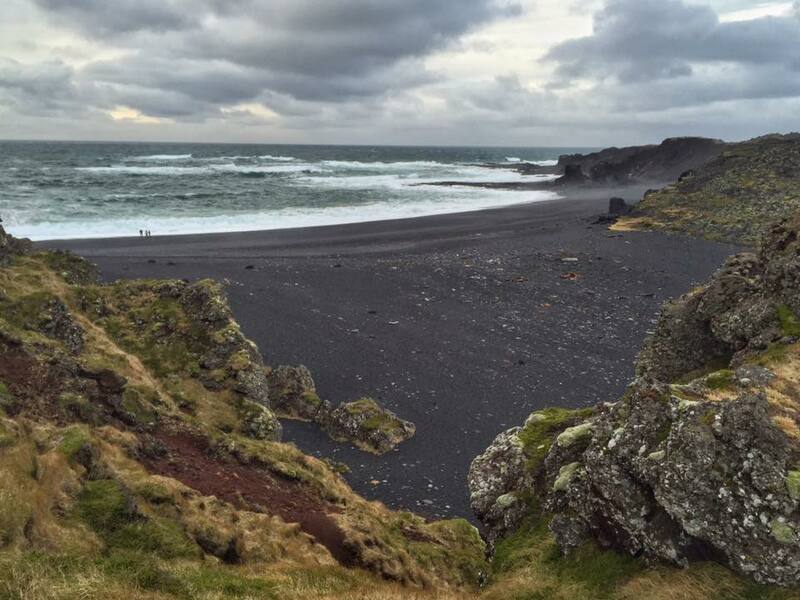 We leave Keflavik and decided to make our way north of Reykjavik to the Snæfellsnes Peninsula. 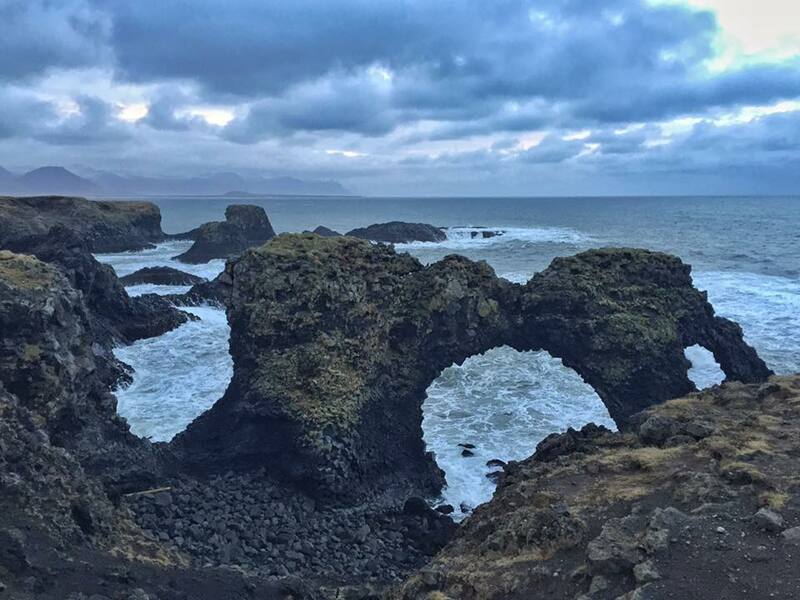 I have never explored this area of Iceland before, but from what I’ve seen through photos, it looks gorgeous. We decide to catch sunrise in Arnarstapi and hope there will be one. The forecast for today is 100% precipitation. We drive for a solid two hours and stop for a gas station breakfast of sandwiches and pringles. 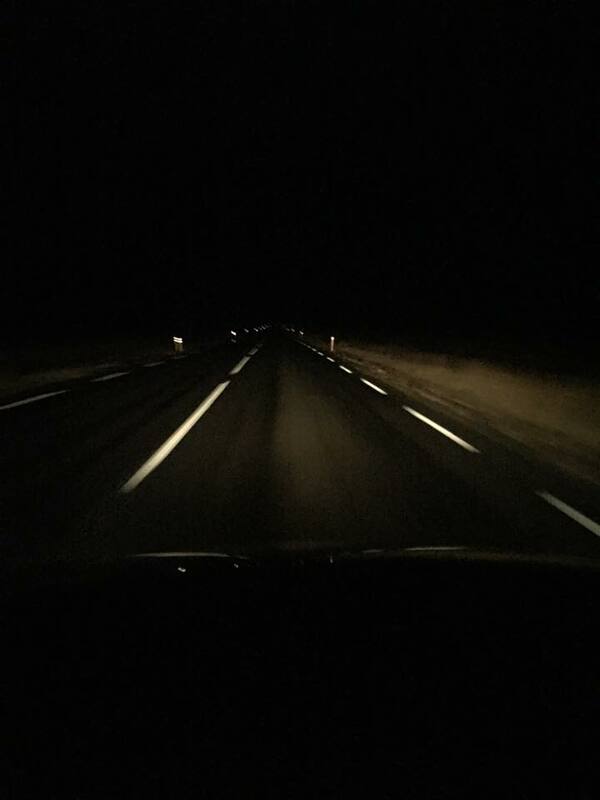 When we get back on the road, it’s close to 8am and it’s still pitch black. There’s no sign on sunlight for hours! I start to fade a bit and Bill puts on some trance music. After about 30 minutes, I have been hypnotized by the music and the fatigue, but I start to see a sliver of light in the skies to the left of us. With the signs of daylight, we also see heavy clouds and we run into the occasional downpour of rain and snow. It doesn’t look promising. 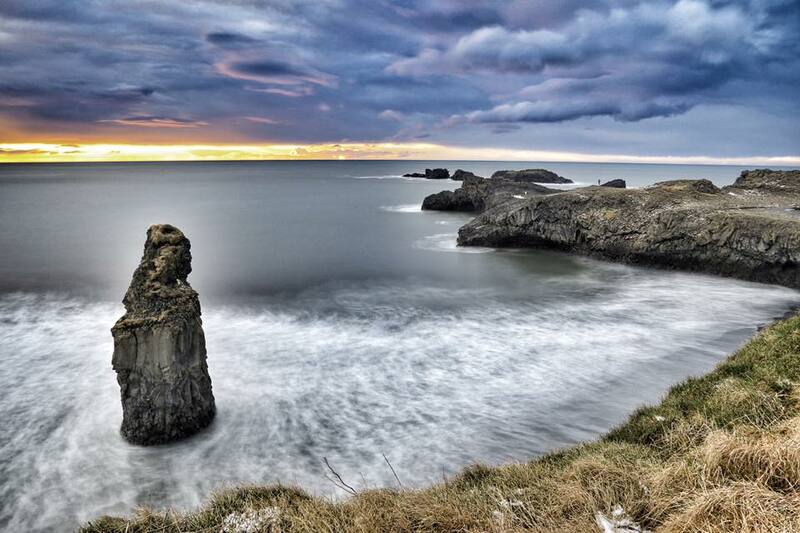 We arrive in Arnarstapi for sunrise. A car of photographers pulls in ahead of us, an d two car loads of photographers pull in behind us… we must have found a good spot! As we walk down to the ocean, we take in the scene around us. Behind us are fjords not yet covered in snow, to the left of us is the popular and often-photographed white house that sits near the entrance to the harbor, and in front of us is a craggy, rocky coast where waves break below on a pebble beach and on a rock archway nearby, called Gatklettur. Dotted here and there are small cottages and homes with moss-covered roofs. 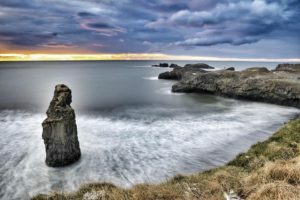 We spend some time photographing the rocky beach, trying to catch a little bit of the pink sky that’s slowly unveiling, but rain wins and eventually forces us back to the car, and the rest of the morning goes a bit like this. Luckily, the showers are short and we manage to wait them out at most of the sights along the peninsula. We take a small hike out to the black sand beach at Dritvik and photograph crazy rock formations that are the Lóndrangar cliffs and stop in at the Visitor’s Center to check out a map. We decide we have plenty of time to drive the full peninsula and end up at Kirksfellfoss for sunset. Our next stop is the little village of Olafsvik. Blink and you will miss it, but we pull over to get pictures of the modern Ólafsvíkurkirkja (church) which is set to a backdrop of fjords and waterfalls. We find a bakery and get a couple of hot chocolates and some baked goods and drive to the outskirts of town where we find a picnic table that overlooks another black sand beach. The wind is whipping, but we insist on sitting on the table soaking in the view of perfect waves breaking hundreds of yards out in front of us. The afternoon drive to Grundafjordur leads us around winding roads that hug steep fjords on our right. To the left is a sheer drop to the ocean below. Waterfalls dot the landscape, which is a golden, amber hue at this time of year, and wild horses roam near the waters’ edge. 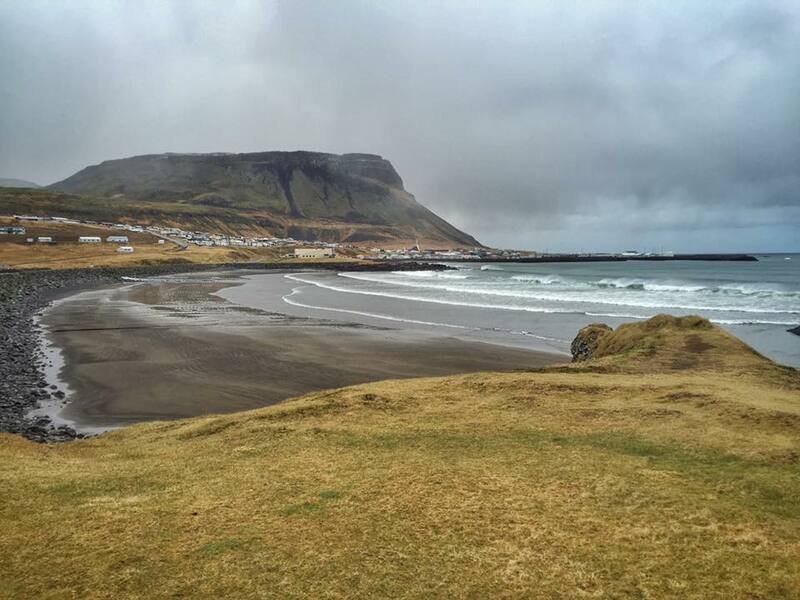 We arrive in Grundafjordur around 3:00, but debate when to actually hike up to the falls. The weather is officially iffy and I want to spend as little time exposed to the elements as is necessary. Bill suggest we go immediately, seeing as we may not get a sunset at all, so we gather our gear and make the short hike up and around to the iconic, often photographed scene of Kirkjufellfoss in the foreground and Mount Kirkjufell in the background. to ourselves. Conditions maintain, and while we don’t get much color from sunset, we do get some shots that we’re both happy with. An hour passes quickly and we forget any feelings of cold, and by 4:30, we’re back in the car and making our way to Guesthouse Höff by way of a precarious, snow-covered fjord crossing. We have been going non-stop for close to 30 hours now with gas station food breaks and no sleep, and we’re oficially cold and tired! 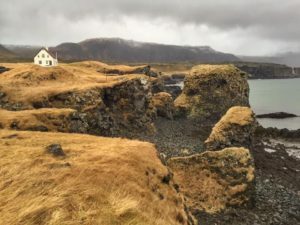 We have no radio reception, so Bill scours through the very limited collection of music on my iPhone and finds Prince’s Greatest Hits… Little Red Corvette blasts from the speakers of our Suzuki Swift as we ascend and descend the fjord roads of Snæfellsnes Peninsula. Along with playing the role of DJ, Bill is navigating and continually updating me on how far we have left to go. 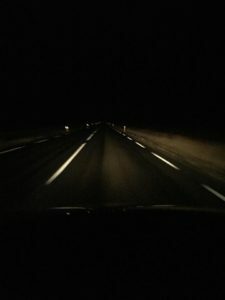 When sleep is almost winning and I feel my eyes beginning to close, he says, “You’ve got this, 10K left, just over 6 minutes.” I want to pull over and ask him to drive the last 6 minutes…but moments later, we pull into the driveway of the Guesthouse. At the back of a gravel road is a bright yellow longhouse, with a grassy roof.